Hydraulic winches available in hoist (GHL Family) and utility (Family GHT) versions. Hoist winches developed for marine cranes, offshore cranes, mobile cranes, drilling rigs, pile hammers and mooring systems for floating and fixed harbours. 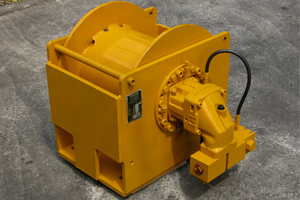 Planetary traction winches developed for crawler and wheel dozers, road and agricultural machinery, transportation trucks, military vehicles, small, medium and large size self-rescue trucks, and any other hoist and linear traction application which demands reliability on load retention and higher line speed. All models available with options such as: Automatic or manual band brake devices, roller presser, levelwind, local or remote control, load, cable length and line speed measure device and last wrap brake. 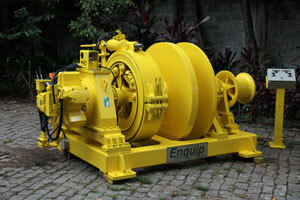 Electric AC winches available in hoist (GEL family) and utility (GET family) versions. Hoist winches developed for general heavy construction, siderurgy and refinary application. Electric and electronic components available in explosion proof option, specially developed for explosive atmosphere applications. Models available with local panel, with start/stop/reverse controls, or local panel with variable frequency drive, or remote control by pendant control or radio control. Air winches configured with high perfomance and rugged design pneumatic radial piston motor, developed specially for marine and offshore applications, mainly for areas with explosive atmospheres. Models developed for man-rider applications. 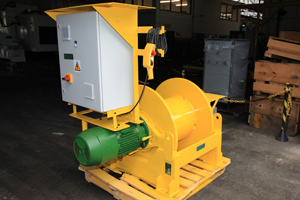 Winches available with options such as: Automatic or manual band brake devices, press roller, levelwind, local or remote control, load, cable length and line speed measure device and last wrap brake. 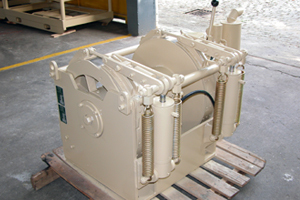 Combined deck winches, developed for marine application. Modular design developed according to the customer specifications. Copyright © 2016 Enquip Ltda. All Rights Reserved.